In April, I was invited to what could be termed the most innovative fragrance launch of the year. It was for Jo Malone’s India-inspired Cologne Intense in Jasmine Sambac & Marigold. The venue was the Dadar Flower Market in Mumbai and the call time was 6am. It was an unusual launch, to say the least, but quite refreshing. But what was more startling than the launch was the fragrance itself. Crafted by Celine Roux (head of global fragrance for the brand) and perfumer Mathilde Bijaoui, the perfume began with the fresh-cut dewiness of jasmine, but ended as a cloud of powdery scent—soft, dry, and perfect for summer. Unlike other jasmine fragrances, which can be extremely aqueous or festive, this was clean and ultra-modern because it was laced with powdery notes. “I wanted this scent to have an addictive quality to it," says Roux. Bijaoui achieved that by blending the freshness of jasmine with the herbaceous notes of marigold. But the final finishing touch, one that makes it so thoroughly modern, is the addition of honey, vanilla, benzoin and a special type of ylang-ylang to give it a quality that makes it cling to the skin. Prototypical powdery fragrances are addictive. They’re extremely dry, a little sharp but softer at the edges. It is a genre in fragrances that hasn’t been explored very much in recent times. In a maze of florals, fruits and gourmands, all of which are so popular that they’re now common, powder scents are ultra-sophisticated and unusual. “These fragrances are really an evocation of the times when the powders were really important not just as cooling on the skin but also used in cosmetics," says Jahnvi Dameron Nandan, perfumer and founder of The Perfume Library, a curated collection of scents. “So you could say that they really had their moment of glory in the earlier part of the last century, when beauty was synonymous with powdering your nose. In those years, powdery fragrances very extremely heavy. A case in point would be Guerlain’s Shalimar, which is so dry that it smells almost smoky. I love its rich, spicy notes, and it’s definitely one fragrance that can be worn by both men and women. But it’s certainly not for everyone. 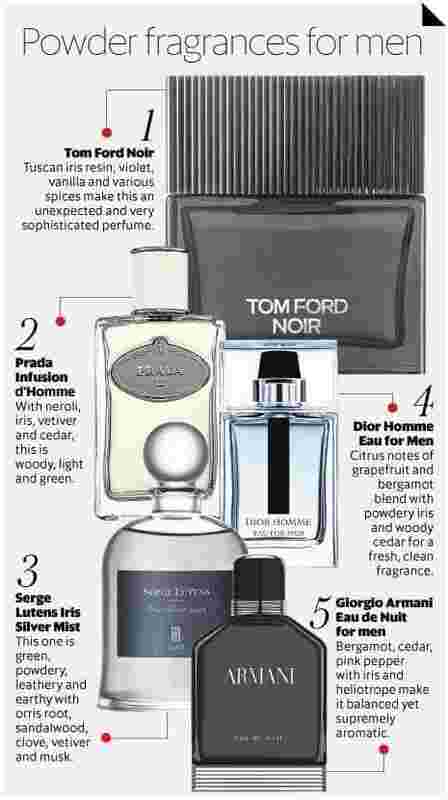 “The primary notes of powdery fragrances are forms of iris, violet and vanilla," adds Nandan. “These fragrances are usually an anomaly in themselves because no other genre of fragrance has a texture ascribed to it." Baby powder, talcum powder, poudre de riz (made with rice, for the face) are all textures associated with these fragrances. And this is why they, especially the newer, more contemporary varieties, are perfect for summer. In 2015, Olivier Polge became the new nose at Chanel. He took over from his father, Jacques Polge, who created many masterpieces for the brand, including Coco, Égoïste, Allure and Bleu. The first fragrance that Polge junior crafted was part of the Les Exclusifs de Chanel collection. Called Misia, it was named after Misia Sert, Coco Chanel’s muse and patron of the Ballets Russes. In fact, even Marcel Proust based two of the characters in his books on Sert. With the fragrance, Polge wanted to recreate the backstage atmosphere of the ballet—feathers, pearls, sequins and lipstick. To do so, he used vanilla, iris, orris root, violet, two types of roses, benzoin and tonka bean. Violet, iris and rose were commonly used to scent lipstick in earlier days, so they were the natural choice for a fragrance as glamorous as Misia. When you spray it, you immediately smell the waxy quality of lipstick. It’s not very attractive at the first whiff, but after an hour the fragrance transforms. It’s creamy yet dry, woody yet floral, it clings to the skin and leaves behind an unusual cloud of scent. For me, it’s an iconic example of a contemporary powder scent. You see, the real USP of this genre is that the scents are airy yet, unlike a citrus or white floral that can be too infantile or sweet, thoroughly grown up and very stylish. Other modern powder fragrances include Prada’s Infusion d’Iris, which is extremely light because it has citrus notes such as mandarin, orange and orange blossom. Then there’s Kenzo Flower, delicate and feminine with violet, rose, white musk and vanilla. Hermès 24 Faubourg, very chic, smells like face powder with iris, orange, peach, sandalwood and vanilla. My other favourite, Bulgari Le Gemme in Ashmelah, with lavender, violet and heliotrope, is a puff of perfume that is so light and airy, yet so glamorous, that it’s unbelievable that the two contrasts can coexist. Oh, and one must not forget crowd-pleasers such as Donna Karan’s Cashmere Mist, Narciso Rodriguez Poudree, and Dior Hypnotic Poison. In India, the Bombay Perfumery offers a nod to powder with Seven Islands, essentially a fruity fragrance, but with powdery heart notes. “I would love to further explore more violet and vibrant orris notes in another project as it’s an interesting olfactive direction for me personally," says Manan Gandhi, founder of the Bombay Perfumery. While powdery perfumes are part of the dry genre of fragrances, they have given birth to another category—the gourmands that are extremely popular these days. “Most gourmand fragrances are built around powdery notes such as vanilla, orris root (the most expensive fragrance ingredient in a perfume palette) and powdery musks." But while gourmands can be almost cloyingly sweet (think of the migraine you get by just whiffing the air at the duty-free), powdery scents are never sweet. The modern varieties may have a bit of dewiness, like that of the new Jo Malone perfume, but they will never smell saccharine, or candy-like. A good powder perfume is dry, cloudy, dusty and always a bit glamorous. Some people consider it ideal for evenings, but I wear Shalimar even on a hot summer day.